CSP Note: Smarties Cheryl and Jen V. tag-teamed on this one! If you want to eat healthy and feed your family healthy food, but have ZERO time to make it happen, today is your lucky day! 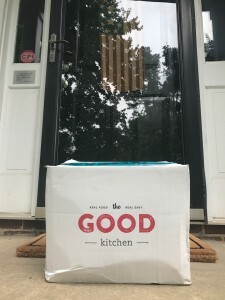 We’ve got our Smarty review on the Good Kitchen, a fresh, fully-prepared meal delivery service that’s headquartered right here in Charlotte. We’ve also got a Smarty Steal and a YUMMY giveaway for you! The awesome team at Good Kitchen was nice enough to send Smarties Cheryl and Jen V. a full order of adult meals and their brand-new Kids’ Lunchboxes to try out on their families. The Lunchboxes are free of gluten, soy, GMOs, antibiotics and additional hormones and sugars, and contain 4 healthy components. They are available for order with any adult subscription as individual add-ons or as their own subscription. These items arrive refrigerated and DO NOT need to be heated prior to eating. At this time there are 5 meal choices each week, but keep your eyes peeled for future offerings. But… what about mom and dad? 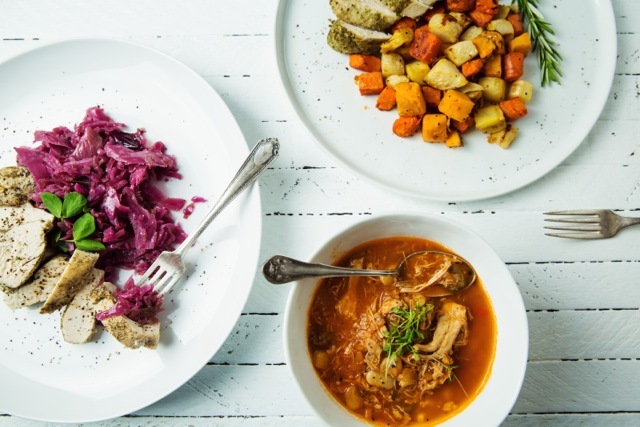 The Good Kitchen is a fresh, fully-prepared meal delivery service. Breakfast, lunch and dinner ready in just 3 minutes. The Good Kitchen offers meals comprised of gluten-free ingredients for busy lifestyles. Their meals are made from grass-fed and pastured proteins, organic and non-GMO produce, and contain no soy, antibiotics, additional sugars or hormones. 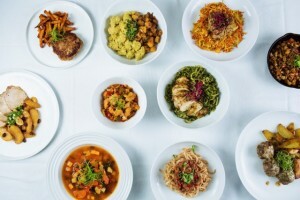 Their chef-driven menu provides seasonal variety on a weekly basis. Orders are placed online and delivered right to your home. Use code SMARTY18 to receive 15% off your first order. Meals arrive ready to Heat & Eat and enjoy, piece of mind included. Cheryl works from home and has four kids in elementary and middle school. Jen works full-time outside the home and has two kids in daycare. They are the perfect duo to review from very different stages of mommyhood. We’ll let Cheryl and Jen take turns telling you about their experiences, then give you all the deets on the giveaway. Confession: I don’t like to cook. Even though I have four kids and SHOULD love to cook, I don’t like to cook (hmmmm, maybe I don’t like to cook because I have four kids?). I feel like we’re always in a hurry going in opposite directions, and I never have my act together enough to get a good menu plan together every week. I want our family to eat healthy, organic, and local, but I don’t always have the time or the energy to shop for and prepare healthy, organic, and local. I know I am not alone. Doesn’t getting healthy lunches and dinners prepared for the fam sometimes feels like a full-time job? If you’re in my boat, you’re going to LOVE getting to know The Good Kitchen. It’s like having a personal chef who doesn’t mess up your kitchen. Seriously, y’all. A personal chef. 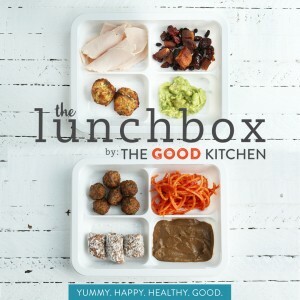 The Good Kitchen recently sent my family several dinners and Kids’ Lunchboxes for us to taste. It came at the perfect time because, although I always think we will slow down in the summer, life actually becomes a whole new level of crazy. I find myself driving all over the Queen City with a nervous twitch thinking I’ve left someone somewhere. So, the Good Kitchen box was a godsend for me this month. First of all, let me say this: the Kids’ Lunchboxes are GENIUS. It’s like a Lunchable with zero guilt. Pop one of those trays of deliciousness in your kids’ lunch boxes for school, camp or the pool, and boom. Done. My younger kids are super picky eaters (blaming my husband on that because he used to make his mom skin his hot dogs…), so I was a little skeptical of what they’d think of paleo and organic. I was shocked to find out that they LOVED the meatballs, hot dogs, and turkey Lunchboxes. And get this: the Lunchboxes aren’t just for kids. I really loved them for lunch or a light dinner. I am always in such a hurry to eat in between meetings, work, and kids’ activities, that I quickly made these my go-to. They were also perfect for swim team nights when our meals times were all off, and I got home too late to make a normal dinner. I see myself keeping these heavy in the rotation, especially when school is back in session. The Adult Meals were AH-MAZ-ING. Three minutes in the microwave and you’ve got a hot meal on the table that is not only delicious, but is high-quality gourmet. You could definitely do two (or three depending on how hungry everyone is) Adult Meals plus a salad and maybe some bread for a family dinner. Our family gobbled each one up. I appreciated every bite knowing that I didn’t shop, dice, heat, stir, or mix anything. See? Personal chef. I’m a huge fan of anything to make life easier. With my husband and I both working full-time and two little ones in daycare, finding time to prepare wholesome, healthy and delicious meals is really difficult to find. I was recently introduced to The Good Kitchen which offers paleo, organic meals that are delivered to your home and ready in no more than three minutes (yes, that’s right – THREE minutes)! TGK offers not only kid meals that offer a variety of great food, but they also have adult meals which made dinnertime super easy in our home. 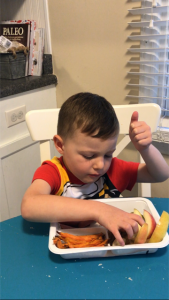 My son totally approved of the hot dogs, sweet potato fries, pickles and apples with sun butter. He literally sat at the table with a thumb up for more than half of his meal when I asked him if he liked it. I had never thought about sun butter before but now we have it for apples just for him! The kids’ meals ranged from spaghetti (sweet potato noodles in marinara) with meatballs to turkey and guacamole (life changing guac y’all). The portions are perfect and everything in the kids’ meals is finger friendly! I love TGK as all the food is organic and I feel good that they use grass-fed and antibiotic free meats. Under each label there were fun facts about local farms or even gave a good joke to share. 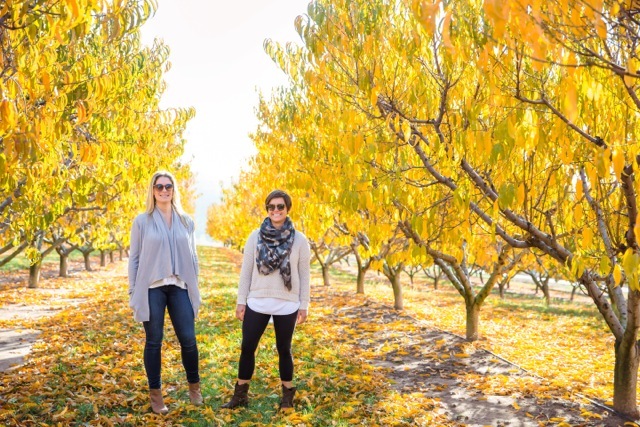 It’s obvious that this company has a passion to spread goodness throughout their community. Each meal is hand prepared and delivered right to your doorstep. Feeding my kids healthy delicious meals is great but in all honesty I loved taking these meals for my own lunch. 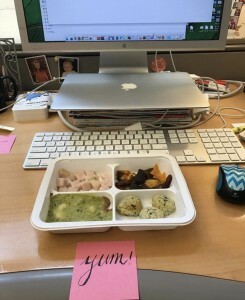 Most days I work through my lunch at my desk. Bringing these delicious meals with me allowed me to fuel up with a yummy meal while I continued knocking things off my to-do list at work. The adult meals ranged from turkey and tasty sautéed veggies to smoked BBQ with baked beans. It made bolting out the door so much easier since I knew I could grab any meal and go! With every meal and the more I learned about The Good Kitchen, I continued to be surprised and delighted. Give them a try! Check out their customizable plans for kids, adults and your family as a whole! 3. In the Comments section below, tell us where you’ll be watching fireworks this July 4th. That’s it! Winner will be announced next Monday, July 3. Order online and use code Smarty17 for 15% off your first order. Presenting the 2018 Smarty Holiday Hostess Giveaway! Smarty Back-to-School Giveaway: $300 worth of digs! I’ll be watching the fireworks in Faith NC! We’ll be in The Outer Banks for the our first visit there over the 4th! It would be a dream come true to not have to worry about meals for my 3 kids when I come back! Will be watching them here in charlotte….just not sure where yet!! We will be in the mountains with family. We will be watching fireworks from our local high school. We have so many choices near by. But we usually just stay near by. My neighborhood has a huge block party with bingo, food trucks, love bands, and fireworks! That’s where I’ll be! We’ll be in Costa Rica on vacation so probably no fireworks for us this year. They have a big fireworks show at the lake every year so that is where we will be! I plan to watch them at the Whitewater Center. At home with my husband. liked and followed al! Iam gonna watch firewrorks at the beach with my hubby n kids! I’ll be watching from home! We will be watching fireworks by the waterfront park this year. Can’t wait well be fireworks!!! I will be watching the fireworks in Washington DC! We are going to watch them at the Berlin Raceway. We will be watching the public fireworks in Everett, Washington this year! I follow on IG and FB. I’m in Alaska and it doesn’t get dark until about 3am……so no fireworks displays. I’ll just be hearing firecrackers from neighborhood kids. I’ll be watching them from Rocky Fork Lake! I will be watching the fireworks in the dock in Barnegat New Jersey. At home with my new puppy! I plan on watching the fireworks right from my back deck. We’ll be watching the fireworks at the local Fire Department’s Fair grounds. We will be watching the fireworks at the University of Delaware and at Chesapeake City, Md. They hold them at different times so it’s pretty nice to go to both. I might go to the local high school to watch it… Although I can see them from my house. We will be watching fireworks at the park this year. Happy 4th! I follow CSP on Facebook (Sheila Korman)! I follow The Good Kitchen on Facebook (Sheila Korman)! We’ll be watching our city’s fireworks display while lounging out on our back patio. I will be watching fireworks from my back deck lit off about a mile away. No lines and crowds!!! On July 4th we will be having family over to grill out! We will be at our daughter’s having a bbq and playing with the grandchildren in the pool. Thanks! I will be at home watching fireworks in our neighborhood, thanks! We haven’t decided where yet. There are several places we’re thinking about. Would love to try this service! We’ll be watching the fireworks over Carmel CC from our neighborhood. I’ll be watching at a local park w/ friends or on TV from my living room couch.